An irresistible sibling story about Raisin, the littlest cow on the farm, and what happens when she gets a little brother—from the author and illustrator of Lion, Lion. Perfect for fans of Hug Machine and You Are (Not) Small. Raisin loves being the littlest cow in the herd. All the other cows dote on her, and life is grand. But one day, Raisin’s mother has a new little cow . . . one who is even smaller than Raisin. And suddenly everything changes. Raisin has never liked change, and this one is the worst. Now no one pays attention to her, the new baby smells funny, and even the weather won’t cooperate. But then, when absolutely everything is going wrong, Raisin discovers a change in herself—one that delights the entire herd. Even (and especially!) the new baby. 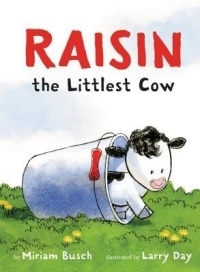 RAISIN, THE LITTLEST COW, was a cute story with a good message that change will come, but it's not always bad. Raisin has always been the smallest cow and doesn't like change. But change comes just as it always does. In her case, change arrives in the form of a baby brother. Raisin has a list of things she likes and doesn't like, just as a child would have. With change being a big dislike, she doesn't welcome her new brother. Because of him, she's no longer the littlest cow and doesn't receive attention like she used to. Everyone's too busy cooing over her little brother. But when a storm comes and her brother grows scared, Raisin softens up and lets him know she's scared too. Then, she takes on the role of the big sister to cheer him up. The only complaint I'd have is that a male cow is a bull, but we still understand that it's her brother even when he's referred to as a cow. Finally Verdict: This is a good children's story to teach about siblings and change. Any children about to become a big brother or sister would enjoy this read.